In late 2016 I had idea about big city map for 6vs6 players. Such map was missing in RWM multiplayer community. Most of maps is open area with forests, fields and with few small cities, villages and lonely houses. I want something between years 1943-1945 (have better units). Panthers, Tigers on Wehrmacht side, T34/85, big SPG's on Red Army side. RWM winter scheme is limited by number of objects and buildings. Also there are some issues with bulding destruction, for some you need atomic bomb. Better choice is use another schema, the richest is RWM-Eastfront summer. 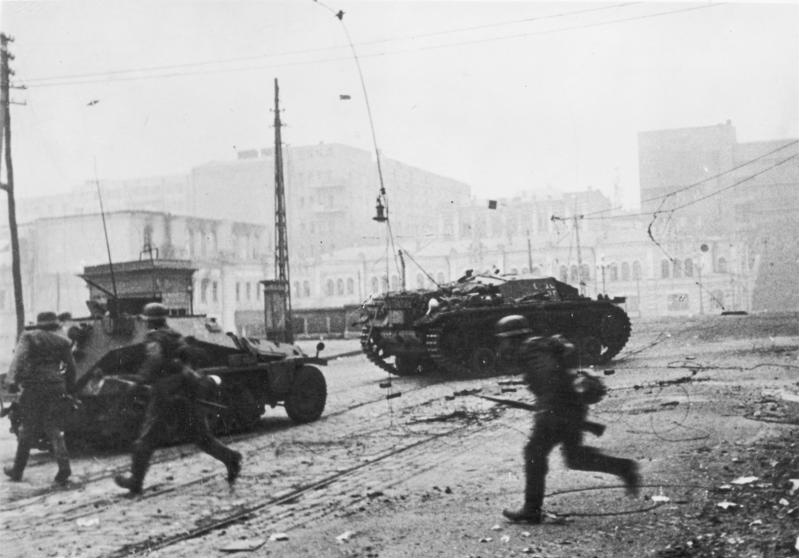 After selection, I was happy with Kharkov battle (https://en.wikipedia.org/wiki/Battle_of_Kharkov), without winter scheme was Belgorod-Kharkov Offensive winner. Of course, the battle for the city was more intense in previous events. This was a compromise. 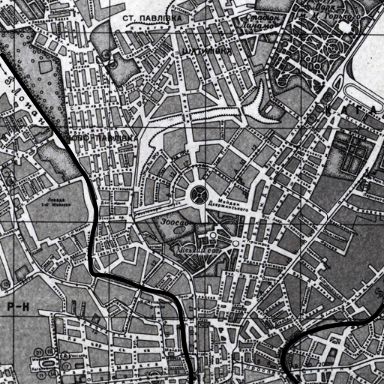 There is more options, we can get historical map or use Google maps, I found city map from the beginning of 20th century, it takes maybe 1/10 of city area. MapImage utility can convert image (Google maps) into Sust map, which makes map making process easier, but be carefull, ratio between map image and Sudden Strike map must be +- correct. Also I checked how other mapmakers are making their nice looking scenery. Then I started with terrain, objects. 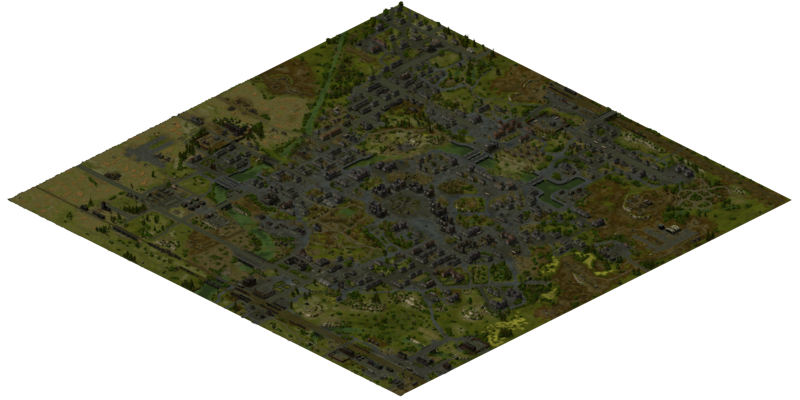 384x384 map tiles size is long term process, it took a year, it was something like 1 hour per day, with long pauses. The biggest challenge is to maintain the appearance of city panorama look, streets have some sense, building have some arrangement. With 800 building per map limitation it can be problematic. It looks better on my next map Berlin Centrum (256 x 256 size), the house area is more dense and they are in houseblocks. Here I chose more wide streets. Later I spent time on few locations like Gosprom complex in the center with circular square which is a certain characteristic of that city. Map is not super detailed, some places still undone. When map is done, this is really quick, you can have script in few hours. We are using similar scripts and units balance which is proven by time. 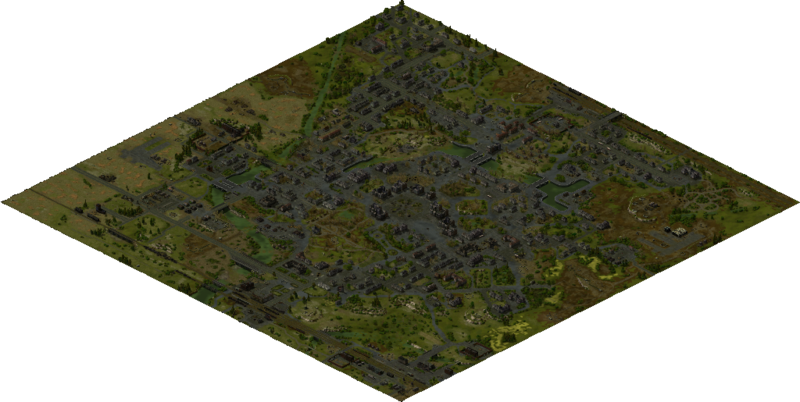 I wanted to revive it a bit so I put there waves of infantry without any transport vehicles, they come in 3 phases, at beginning you can take all defense position, secure airfields and later during the game their role is boost attack and secure positions (buildings) in the city. Biggest issue in RWM is that USSR units are really mobile and Germans bit slow, it needs good ratio of fast and slow tanks. 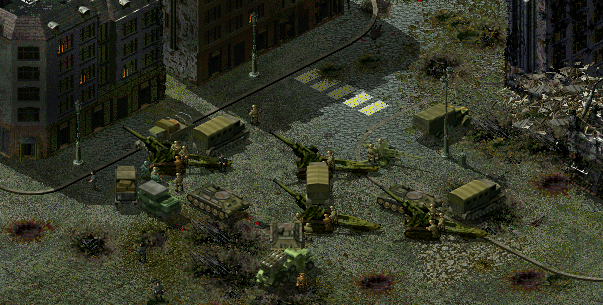 What I don't like is too many units, too many anti-tank guns which are making gameplay static. The tanks have the main role, you can make fast attacks with infrantry support and go through enemy positions. But rather with the support of someone on the wing. There are several defensive factors, terrain (hills) + trenches + static guns (88mm), buildings, players have cca 5 pioneers, 3 right from the start. Long range artillery can have big role here. Some players don't like it's fire but how can be battle in city without heavy guns? :) And it also makes their asses more mobile. I put 2x static 305mm BR-18 they are controling defensive area (picture under text). And 4x 280 G BR-5 which can be towed. Plus equivalents of this on the German side. Obtaining ammunition for big guns is time consuming, it's not so easy control it effectively. Airfield if funny thing too, map have 2 big airports and 2 small, they can be used if you can protect them. After few fixes it was +- working as it should, players of both sides were in their positions at the same time, then came intense house to house fighting in built-up areas. Players were spending their time by capturing buildings (It can be problem for new one's), bonus is in bigger view and in defense boost. There was problematic area in bottom corner, which was fixed by defense lines, it's still an attractive place to attack but if you have some tactical thinking it's not big deal. Anyway balancing 6v6 map isn't easy. How good or bad Charkow is you can see on videos :) Or you can join our multiplayer community. We have new map capturing the battle in the center of Berlin, end of April 1945. Map is little bit different from the classic schema. Germans are here rather in defensive situation, Red Army have lot of Katyusha's and heavy artillery, storm units and more infantry. Germans have only city blocks in their back and bad prospects. All known places like Brandenburger Tor, Moltke bridge, Reichstag, Tiergarten are included. Anyway, everybody who want play with us is welcome!